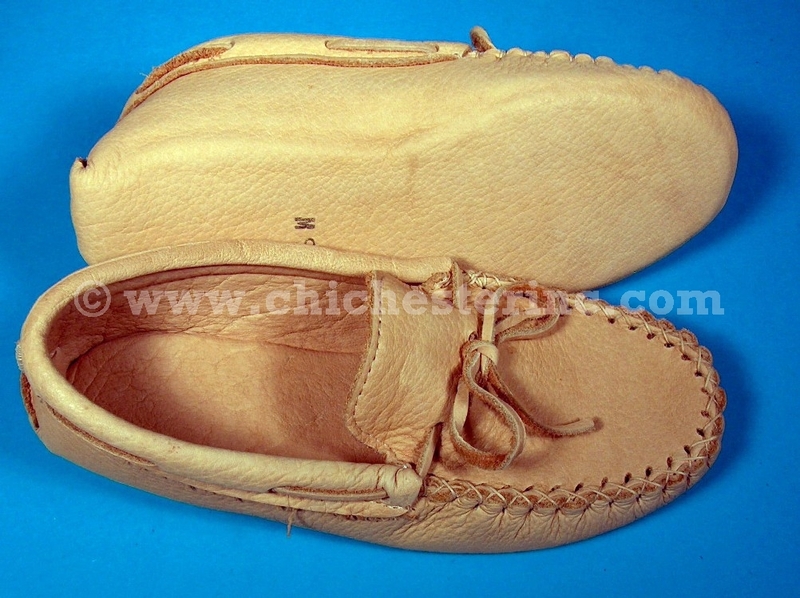 The buffalo hide moccasins are made by Native American artisans from the Huron Nation in Canada using leather from hides from a ranch in Quebec. The moccasins are made from full grain buffalo leather and are lined with full grain leather as well. There is a double layer of leather on the bottom, sides, and top. There is a foam insole in between the two layers on the bottom. Buffalo leather is very strong and lasts well--Elizabeth at Chichester has been frequently wearing a pair around her apartment in Toronto for the last 10 years with very little apparent wear. She expects them to last many more years. 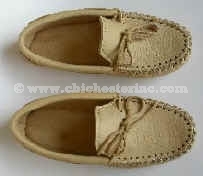 We do not know how long these will last if worn outside--not something we recommend. 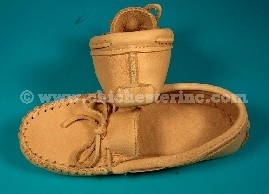 The moccasins come in full sizes only. If you wear a half size, order the next size down as the leather will stretch over time, but not as much as moose or deer will. 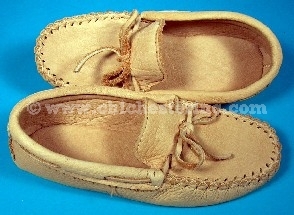 The moccasins are made from North American Buffalo, not water buffalo. The buffalo leather is a by-product of the food industry. The buffalo are ranch raised for food and are not killed just for their leather. Click on any of the pictures in this section for an enlargement. We want you to be able to see exactly what you will be getting. The men's and women's moccasins look the same. If you have any questions, please call us at the toll-free number below. Thanks.